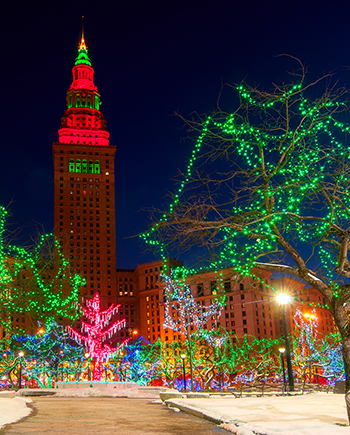 Join the fun and festivities as Downtown Cleveland lights up for the holiday season. Enjoy a day of FREE family-friendly activities at the Library, then check out all of the Winterfest fun in and around Public Square. 10:00 a.m. – 4:00 p.m. Train displays by the Cuyahoga Valley S-Gauge Association at the Toy Train Depot. 10:00 a.m. – 5:00 p.m. Friends of the Cleveland Public Library Gift Shop and Used Book Sale ($1 children’s books). 1:00 – 3:00 p.m. Live reindeer and an ice sculpting demo at the Winterbell Station in the Eastman Garden. 2:00 p.m. Free cookies and hot spiced cider (while supplies last).